The word “ritual” can conjure up images of a negative nature, but rituals can be created for every purpose imaginable. Rituals do not have to be religious or even spiritual; they can be as simple as doing something repeatedly. The purpose of a ritual is to set an intention. Consistency and repetition focuses your attention on a goal or purpose.Getting up every morning and asking yourself “What good can I do today” becomes a personal ritual that creates meaning and attention for the upcoming day. Following the idea that “what you put your attention on grows stronger” is behind the principle of every ritual.We have included a sample ritual you may want to use or adapt to your own purpose. Some of the best helpers we have are those on the other side. (angels, spirit guides, members of our soul family). How do we connect with a spirit to gain help? Sometimes the clearest way is to meditate with crystals. You can ask for signs throughout the day and have the crystals with you. Different crystals give you spirit awareness, communication and clarity. Be open to hear the specific messages that are given to you. 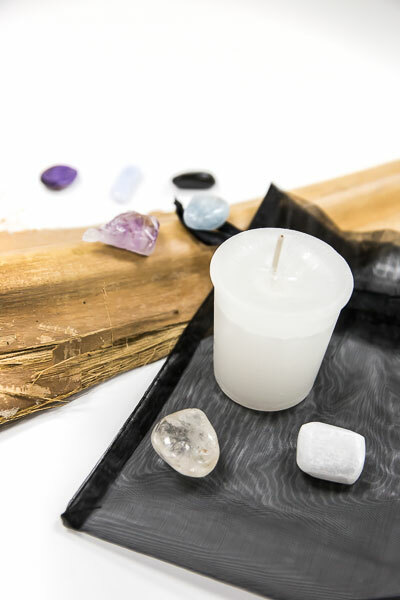 All of the crystals listed below can be held in your hands while you meditate, placed under a pillow while you sleep, or carried with you to gain insights about your life. Use the crystals in the best way for you personally. Spirit communication is always a personal journey. Note: during and after the communication process, hold a grounding stone for approximately ten minutes. Grounding crystals raise the amount of energy being received from the earth and stabilize your vibrations so that you are not lightheaded or dizzy (always a strong possibility). A clear head always helps when deciphering any messages you have received. Amethyst opens up the upper chakras, clearing the energy pathways. It helps alleviate anxiety and impatience so you can concentrate better during meditation. I t helps gain greater insights while protecting the user. It is powerful for dream messages. Blue Lace Agate balances your emotions so that you can more easily raise your energy to receive information from spirits. Clear Quartz is the ultimate amplifier. It boosts the energy of any crystal you use and concentrates your energies towards your goal. It creates a bond with the spirit realm. It acts as a fantastic channel for higher beings and helps you sense and commune with those spirits. Charoite helps you connect with the divine by enhancing your natural intuitive talents. Often we receive messages through sight, sounds, and impressions. I t will help you to receive information from spirits. Selenite cleanses the aura, aids in spirit interactions and promotes dream recall. Celestite opens your connections to higher realms. It helps you relax, clearing away thoughts, worries, or stresses you might have. Then it strengthens your link to higher beings. It soothes and can gently transition you into a dream state and help you recall and interpret the information you gain. Grounding your energy: Obsidian protects your aura and grounds you. It brings wisdom to your thoughts and helps your intuition. A photo or item owned by the soul you want to connect with. White candle. Coarse white salt. Go into a room or space where you will not be disturbed. Hold the crystals and salt or place them in a circle around you. Keep the obsidian in your hand. Ask for your angels and guides for protection. Focus on the person you want to connect with (you can hold the item or photo as well). Invite them to come and spend some time with you. If you have questions or just want some general guidance, ask for that now. Be patient. Wait for their answer. Follow your intuition as you receive the messages. Maybe it is only a word or two. A scent that brings you comfort. A memory that reminds you of a happy time. A feeling of ease or forgiveness. Everything that you experience during this time is a message for you. Newer PostScorpio - "I Desire"